IBM® Content Manager OnDemand is the industry leading report management product. It provides enterprise report management and electronic statement presentment. It is high-performance middleware for automatic management of formatted computer output and reports. Content Manager OnDemand helps companies gain significant return on investment by transforming costly high-volume print output to electronic information capture and presentation in support of customer service. Content Manager OnDemand includes the OnDemand Web Enablement Kit (ODWEK) with which companies can build their own Web applications for interfacing with Content Manager OnDemand. Many companies have used ODWEK, and the usage continues to grow significantly as companies integrate Content Manager OnDemand into their enterprise Web and portal solutions. 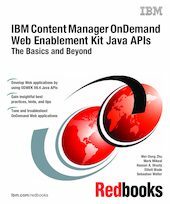 In this IBM Redbooks® publication, we provide an overview of the ODWEK version 8.4 Java™ APIs and explain the commonly used APIs for application development. In addition, we examine the capabilities and usage of the APIs through use cases, best practices, hints and tips, and code snippets. We also explain connection pooling, folder searching, document retrieval, document storing and updating, memory and performance, and troubleshooting in terms of application development. The ODWEK Java APIs can be incorporated into any Java-based application, including stand-alone applications, portlets, servlets and Web services. We illustrate the APIs by using servlet-based code to encourage an integrated understanding of the topics. This book is intended for application developers who are responsible for developing Web applications that interface with Content Manager OnDemand. It also serves as a good reference guide for developers and system administrators to fine-tune and troubleshoot Content Manager OnDemand Web applications.